Watch Your Students Learn in Real-Time! 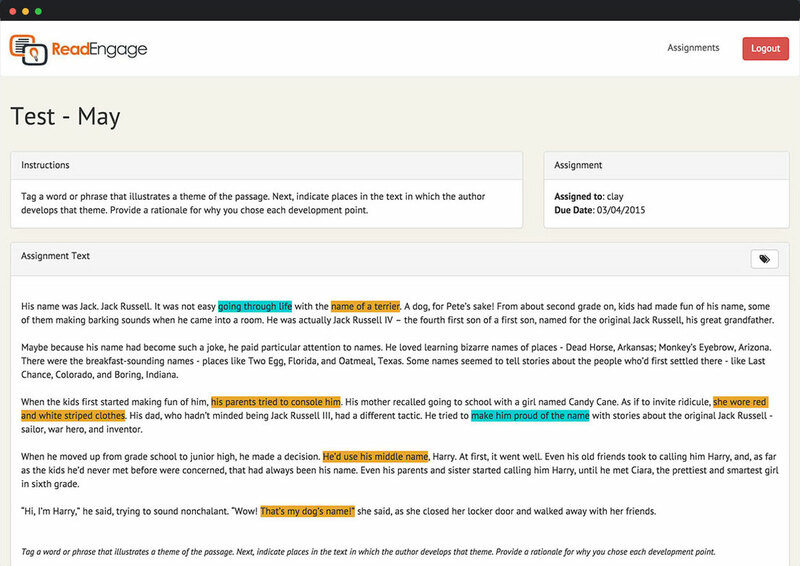 Dynamic, in-process visualization of student and group engagement with a text. Utilize the immediate evidence of student proficiency to inform instructional decisions. Watch the demo below to learn more about the ReadEngage education product. In as much time as it takes for a student to say or type what’s on his/her mind, a teacher can identify whether or not a student is on track with student reading comprehension goals. There is no need to reinvent the wheel because ReadEngage will adapt to your curriculum...not the other way around. In a 1:1 classroom. On a desktop in a computer lab. On any device remotely. ReadEngage is a web-based platform, giving students and teachers access wherever there is an internet connection. I enjoyed using the ReadEngage program in my classroom. The ease of use and color makes it user-friendly, and the real time feedback and ability to use your own text makes the program a winner. I appreciated the opportunity to test the program. ReadEngage gave me immediate, real time feedback on what my students knew and were struggling with. This allowed me to address issues before they submitted their assignments. and help students when they needed it, not after the fact. ReadEngage allows me to see the comments and answers students are writing in real-time, which has helped me to identify issues immediately. I can also share exercises with other teachers, making this a great tool for collaboration. Watch your students think. Watch your students engage.